Aware that this time of the year is called "The Rut" and that this young male moose might be lonely for company, I decided it might be best to turnaround and head back downriver. A father and son were fishing from a canoe and I told them of what I had just experienced. Perhaps they also got a chance to see Bullwinkle. On the trip downriver, I was thinking of how frustrated I would have been if my camera had not been at hand and wondered if anyone would believe me without photographic proof. Trash recovered today was quite modest. My count for the day was only 7 (a lucky numer for sure!). Of these 3 were recyclable and redeemable and 4 were misc. trash such as a Wendy's visor cap and styrofoam cup. My YTD total stands at 4210. Additional photos from today's patrol can be seen at this link. I think it's great to know how attractive you are to critters. What did the Belted Kingfisher do once he knew you had seen the beast? Dixit et Fecit, Perhaps the attraction is my Native American flute playing? Seriously though, the Kingfisher, his mission complete, went off to attend to other, important kingfisher matters. Do you suppose the Moose, with the aid of the Belted Kingfisher, awaits your next visit? Should you use a less attractive Kayak? Is this an Acton or Concord Moose? Dixit et Fecit, Rather than awaiting my return, I think the moose has his mind on other matters. As I reflect on last Sunday morning, I think the brief appearance of the deer was a clue to what was really going on. I think the young moose is desperately in search of a mate and doesn't realize the difference between a female moose and a female deer. Thus, in the process of starting to collect his first harem, he may have considered me a possible interloper. Sort of like he's "Looking for love in all the wrong places." Hopefully, he comes to his senses and gets out of town without loosing a game of "Chicken" with a truck or car. Concord or Acton moose? Don't know. If I see him again, can I tell him he'll find what he's looking for in Sudbury? Wonderful! Was he in a spot that is forested enough to keep him safe from traffic? This must be the same moose identified in the police blotter as having been spotted by the guard at the Prison. Ria, The moose was in a wooded area where I frequently see deer. It is bordered by Rt. 2 to the north, Baker Ave. to the east, Rt. 62 to the south and Commonwealth Ave. to the west. I agree that it must be the same moose the corrections officer reported seeing on Commonwealth Ave (near the prison) 2 days before my sighting. He was within a half mile of the prison when I saw him. I've been back to the area twice since and have not seen him, so he may have moved on. Hey, thanks for posting these pics of the Moose. I love moose and it's amazing to see a Bull in this area! But unfortunatley, I don't know if you guys heard about the bull that got stuck and killed this morning on Rt.3 in Billerica, but I'm pretty sure this guy in the pics was the one that was killed. If you look at the pics to compare and put the clues of his whereabouts together, you can only assume it was him. He was stuck right at the Assabet river overpass on Rt.3 and it would have taken him about this long to get there from where he was last seen in Concord I'm afraid. :( Sorry for the bad news guys, but at least we have the pics to remember him by. Keep up the good work. Chris, Thanks for the update concerning the moose hit and killed on Rt. 3 in Billerica. It very well may be the same moose. Can you provide a link to your photo that doesn't require a sign-in? If you compare these pics to those of the ones you took, you'll see the similarities, particularly in the antlers. What are the chances there are 2 bulls in the area that are of 1 1/2 - 2 years in age?...Let me know what you think. Chris, Thanks for the link to the photos. 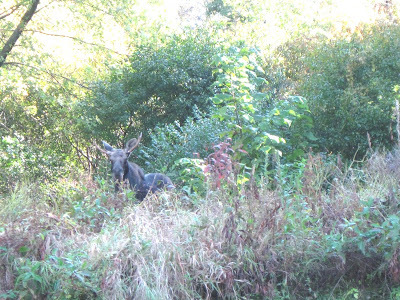 I agree with you that it most likely is the same young male moose I encountered 6 weeks ago in Concord. It amazes me that the animal has been in these parts for that length of time. Too bad for the young moose and the car but fortunately the driver survived the collision. Wow -- that's pretty crazy. 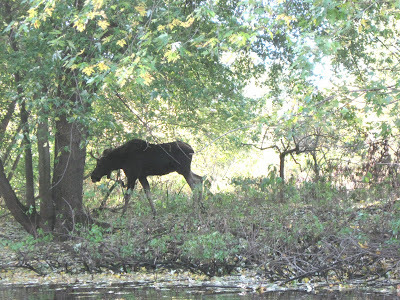 I live in Peterborough, Ontario, about 1 1/2 hours NE of Toronto and even here, a Moose siting is pretty special. That must have blown your mind! Memorable indeed. Thanks for doing your blog. Even though I will never paddle your local rivers, I appreciate what you do. While I cannot hold a candle to you and your trash picking, I am a trash picker myself and think it is something all paddlers should do, to one degree or another. Merry Christmas and paddle on! Hello lakrabbit, Always good to hear from another trash picker and thanks for your comments. Hope you have a Merry Christmas as well!